Here are all the commitments made by Islington-based organisations to mark Carers Week 2014. If we all deliver on these promises, we can make a big difference to the lives of many carers in this borough. Islington Carers Hub pledges to work with statutory and voluntary partners to give Carers Week a borough wide focus to improve signposting to the information and support on offer from ICH and others. As well as smaller activities for hard to reach carers, we will host a Carers Week Event where carers can find out more about local support, meet others and enjoy a day out. We will ask partners including our local MPs and councillors to each pledge at least 2 things they will do over the following 12 months to identify carers and signpost them to appropriate support. Until the death of my father, I was a carer myself and know that carers carry out an invaluable role in our society. I pledge to work together with Islington Carers Hub and other carers’ organisations in my constituency to find and support carers. I will signpost carers who come to my surgeries towards these organisations, and will support my team in doing the same. Information from Islington Carers Hub will be displayed clearly at my surgery venues. As MP for Islington North, I support the Carers Week Quest because I value carers’ contribution to society. In my constituency work, I signpost people with caring responsibilities who contact me to Islington Carers Hub and other local carers’ organisations. Our care system needs to better support these people who give vital support to loved ones; my parliamentary work reflects this and I will continue to fight for a fairer deal for carers. Islington Council pledge to continue our support for the many thousands of unpaid carers in the borough. We recognise the vital role carers play in supporting frail, sick or disabled family members and friends but we know too that carers health and well-being can suffer as a result of caring responsibilities. We are determined that all our councillors and staff are aware of the issues affecting carers and are able to support them and to refer them to organisations like Islington Carers Hub and we will work to make this happen. Islington Council HASS and Islington CCG will establish a GP Carers Navigator to work with GP practices across Islington to support practices in identifying, recording, and signposting carers to other support services and to provide on-going training and support for practice staff. Islington Council HASS and Islington CCG will undertake research into carers health and wellbeing needs and the barriers experienced by carers in accessing these needs. 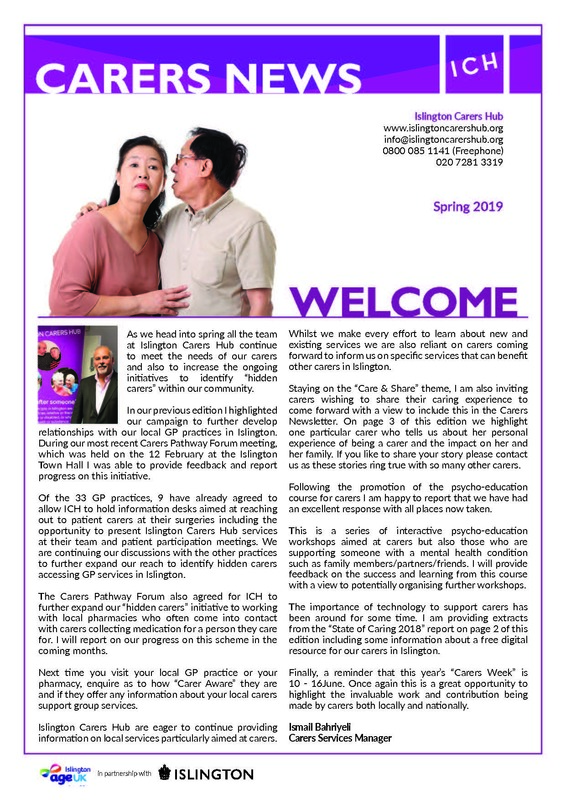 • Islington Council’s Seasonal Health Intervention Network (SHINE) will add Islington Carers Hub to its standard list of interventions enabling advisors to make a direct referral. • SHINE advisors will ask questions to identify carers during their assessment and be aware of the needs and services available to carers in Islington. • The Seasonal Health Intervention Network will make its home energy management course HomeSmart available through Islington Cares Hub; this will be specially tailored to make it relevant. Islington CCG and Islington Council will establish a GP Carers Navigator to work with GP practices across Islington to support practices in identifying, recording, and signposting carers to other support services and to provide on-going training and support for practice staff; Islington CCG and Islington Council will undertake research into carers health and wellbeing needs and the barriers experienced by carers in accessing these needs. • Review our carers’ partnership board and make any improvements. • Meet with the leaders of local carer organisations to identify how the trust can improve its services. • Engage with carers to set priorities for the trust to implement. We pledge to support the Carers Week Quest by identifying service users who have caring responsibilities. We commit to monitor and feedback that information to our staff and network of linked providers to raise awareness of carers needs and ensure they receive the best possible support. We will highlight our free advice and information services throughout the week to ensure service users with caring responsibilities are aware of the support that they can access locally. 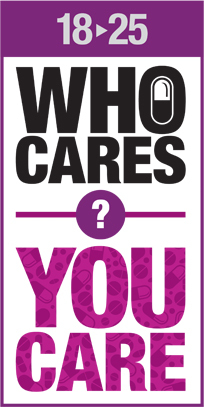 People affected by the drug and alcohol misuse of someone close to them often don’t think of themselves as carers and are generally not seen us such by others. Therefore we at CASA Families, Partners and Friends Service pledge to continue to raise awareness of drug and alcohol carers and their needs within Islington and to provide services for them. It is our experience that when drug and alcohol carers get advice and support, they can play a vital role in the recovery of the substance misuser. We will continue to offer individual and group support, and to liaise with the borough’s drug and alcohol agencies, as we have been successfully doing for the past ten years, to benefit drug and alcohol carers in their own right and to help them play a positive role in the recovery of their loved ones. CASA Family Service pledges to continue to support Young Carers in Islington who are affected by Parental Substance Misuse. We will do this by offering 1:1 support, groups, family workshops and individual family work where appropriate. We will continue to highlight this issue and the support available to all the professionals we work with. CASA Family Service will continue to help identify and refer for support the partners and other adult family members affected by problematic substance misuse in Islington. Recognising the impact of the substance misuse on them and the caring role they perform. Centre 404 pledges to continue to support carers in their fight for recognition of the role they play in society. This year Centre 404 will be hosting the largest carers’ health and wellbeing event across Camden and Islington. Help on your Doorstep is a charity that encounters people in their own homes, who otherwise might not access services, and helps them to access the services they need through referrals. Our frontline workers will receive input from Islington Carers Hub on how to recognise’ carers. We will actively refer the carers we meet to this and other local carers’ organisations, and make them aware of the help that is available. We have added ICH to our Resident Report Scheme application form as a potential onward referral pathway. We will invite ICH to brief our staff so we are better placed to identify and refer carers for support. DAAFFII (Drug and Alcohol Affected Families and Friends in Islington) pledges to continue to find and give informal support to those ‘hidden carers’ who are struggling to cope with the drug and/or alcohol misuse of a substance misuser to whom they are close. We know that people benefit from meeting others whose situation is similar, and being able to discuss their problems without fear of censure or lecturing. We also know that such carers give each other the support and encouragement needed to cope with living with addiction. We will invite Islington Carers Hub (ICH) to set up a display in the Finsbury Park Trust reception area during Carers Week to alert all other tenants and callers at the office to the services on offer to carers. We will continue to display ICH publicity throughout the year and promote ICH services. We will produce some specific leaflets for carers about our employment rights, welfare benefits and debt services. We will work to improve referral links to carers’ organisations locally. We will have a stall at the Islington Health and Wellbeing day for carers. Islington Mind Dual Diagnosis Carers Service pledges to increase awareness in the local borough that a specialist service exists to support carers of people with both mental health and drug or alcohol problems. During Carers Week we will work in partnership with Islington Carers Hub to ensure that local carers have a week when the focus is on them and all that they do. During the coming year we will seek to ensure that we provide these carers with opportunities for reflection, support and some respite from their caring role. • raise awareness of the needs of carers. Yecco pledge to continue with the development of their health and wellbeing platform which aims to help individuals and families self-manage their own conditions in collaboration with health care professionals, whilst acting as a tool to support carers in the care coordination of their elderly or disabled relatives.